World famous Shakespearean actress Ada C. Rehan (1860–1916) She was born (Charlotte) Delia Crehan in Shannon Street and moved to the United States at 5 years old. She was misbilled as Ada C. Rehan early in her career and the name stuck. She is buried in Green-Wood Cemetery Brooklyn. On the 21 November 1813 a house in May’s Lane, Thomondgate blew up, as the occupants were trying to dry gunpowder in an iron pot over an open fire. 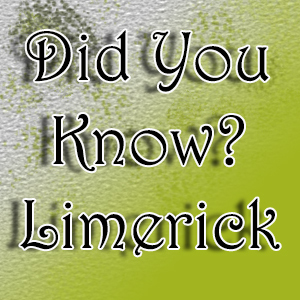 In 1902 in the Limerick Free Library there were 5,199 volumes of work. Theological, 105; Travel, 227; History & Biography, 1,615; Economics, 135; Science, 612; Arts, 79; Poetry, 159; Fiction, 1,739; Miscellaneous, 528. The recesses of the foundation stone of the Carnegie Building (Now the Limerick Art Gallery) contain 4 bottles, which contain the currency of the day (1903) as well as a copy of the Limerick Leader, Limerick Echo, Limerick Chronicle, Munster News and a parchment recording the event. The baptistery of St. Mary’s Cathedral is the burial place of Catherine Plunkett (d.1752). Her husband Walter was commissioner of the Limerick mint in 1689. In 1911 in Limerick there were 3 Barrack Lanes as well as a Barrack Hill, 2 Church Streets, 2 New Roads, a New Street & New Walk, a Hall’s Range, Hall’s Lane & Hall’s Bow. On the 3rd of September 1848 a Mr. Hampton, Mr. Hampden Russell, and Mr. Townsend made a successful ascent in a hot-air balloon “Erin-Go- Bragh” from a yard in Cecil Street. In 1224, in a Royal valuation of King John’s Castle it was found that the goods within it were “scarcely worth 18 pence”. Between 1824 & 1870 there were 53 Straw hat makers recorded in Limerick city, they were all women. Mary Jane Kelly, the fifth victim of Jack the Ripper was born in Limerick before moving with her family to Wales as a young child. St. Mary’s Cathedral has the only complete set of misericords (mercy seats) left in Ireland. They date from the 15th Century. The year 1739 was known as The Year of the Great Frost which lasted 40 days, it caused some to survive on “cats, dogs, mice, carrion, putrid meat, nettles, docking”. NextA letter from Australia, 2006.